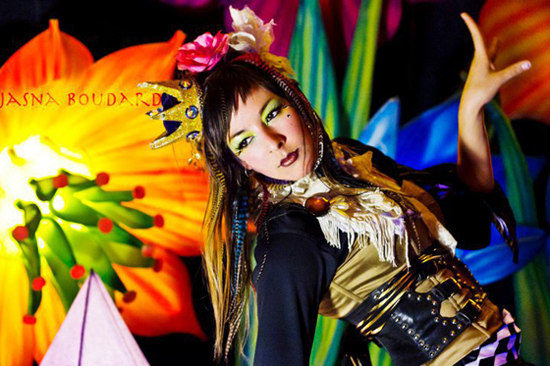 Ali Luminescent, an international performance artist and teacher, can be found gracing the stage, the screen, magazines, and right here on the world wide web. Indulging in hoops, fire, stilts, aerial-and at times all of them at once, Ali Luminescent weaves an intricate dance of joy and delight. She found the hoop in 2006 and has been growing her movement repertoire exponentially since. Her background as a speech-language pathologist gives her insight as a teacher for finding new ways of breaking moves down into manageable steps- catering to her students and the different ways in which each one learns. Through the power of practice we can achieve anything! Ali Luminescent was featured this past Fall on Project Runway as the winning look on stilts and can be found in the pages of Marie Claire, Juxtapoze Magazine, W Magazine, India Times, Australia’s “Mix” Magazine, Bill Cunningham’s Style Section of the New York Times, and Polyprohoops.com. Sign up for her newsletter to stay up to date with where to catch her next! Performance and teaching schedule for 2016 already includes South America, Thailand, and Europe. Interested in having Ali Luminescent at your next event? Just drop a note on the contact page and someone will get back to you shortly! Please contact me for rates and booking.